Rejection. It’s painful and demoralizing – and what’s worse, those feelings seem to arrive all at once. It’s hard to keep pushing forward, to keep making that attempt at reaching out, putting yourself out there. Every writer has been rejected multiple... countless times. Even professional writers today have scripts and projects that either are rejected or get stuck in what is called “Developmental Hell” – where they go to die, essentially! I know the feeling of all of these things as they have happened to me. Right now my current project in development and I get nauseated thinking about how it’s to start filming next month and how little has seemingly been accomplished... is it headed towards hell, maybe even already there? “We checked out your material recently, and sadly we didn't respond to it as strongly as we would've hoped. Given the number of projects we already have, we need to be extraordinarily passionate about the material … and unfortunately SCRIPT NAME didn't quite get it there for us. Aren’t they so nice about the rejection? Indeed, but nonetheless my script failed to inspire, excite, intrigue, whatever it was, this company didn't see enough to take even a chance with it. So that’s a hard one to swallow, and it’s painful and demoralizing. Who might you ask is Mr. Hewson? His name is Bono and he is the lead singer for a group called U2; one of the most popular and successful rock bands of the last 30 years. So the point is, keep believing in yourself and do not let rejection get you down for too long. Yes, it will impact you, and take the wind out of your sails. But let that go as soon as possible and get back to work! 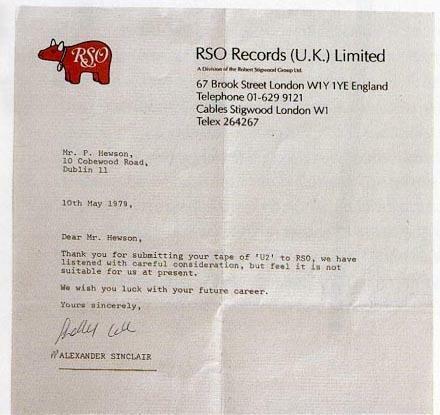 * note another website already mentioned this famous rejection letter in a blog post, but did so a day after I posted about it on my twitter!